From November 6th through the 9th, members of the Mediacurrent team headed to San Francisco for the Bay Area Drupal Camp. Hundreds of Drupal enthusiasts convened at the Palace of Fine Arts to take part in some fantastic sessions, code sprints, and all the San Francisco has to offer. Mark Casias and Matt Davis weigh in for Part 2 of BADCamp's highlights. BADCamp is by far my favorite Drupal event. Granted this was only my second time attending, it is a bit of a homecoming for me. I grew up in San Francisco and more to the point on the Presido, which was right next to The Palace of Fine Arts. We stayed a block away from the very first bar I ever patronized. Not a very good Drupal point, but still made this one of the best events. My second shout goes to BoF’s. BoF stand for “Birds of a Feather” which are unscheduled, ‘lightning’ sessions that spring up and almost any Drupal event. Though I’ve been to many a Drupal event, I rarely attend these, however, I saw the one that was put on by the developers of PHPStorm and had to attend it. PHPStorm is my IDE of choice and it was great to sit down with one of the developers of the program and vent on some frustrations, only to be shown that I blatantly missed the thing that caused the frustration. If I had a nickle for all the PEBKAC (Problem Exists Between Keyboard AND Chair) issues that frustrate me. During the BoF, we even converted a staunch VIM and ST3 user. Also during the same BoF, we got a great demonstration of Kalabox2 by one of the developers on that project. Kalabox2 is a virtual environment using the power of Docker and will help developers set up their environments to match the Pantheon service. I could ramble on for hours about other talks and demonstrations I attended. With all my long distance friends and contemporaries, there were even more discussions outside the arranged time of the conference. Code sprints even were held late into the night at the home offices of Pantheon. Once again, with BADCamp, the Drupal community showed its greatest strength. Community. 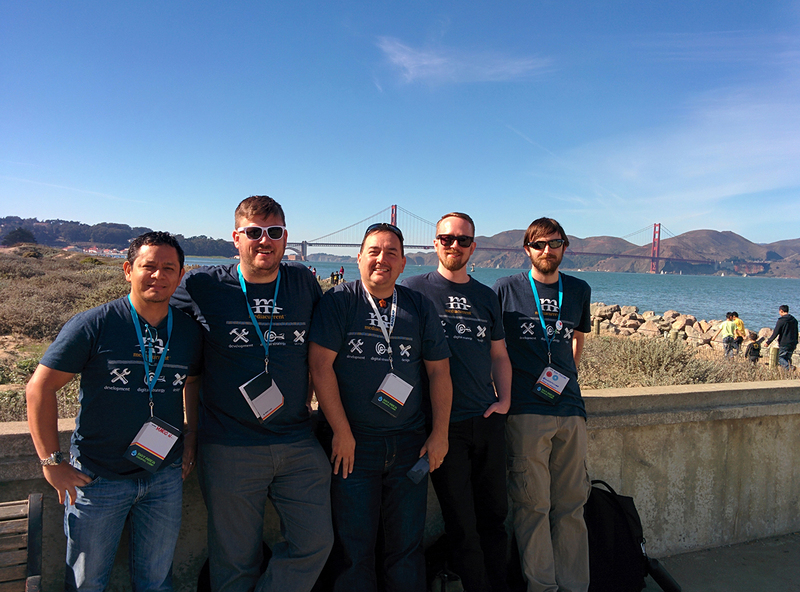 Never having visited San Francisco before, I was really excited to have the opportunity to attend BADCamp this year. I had heard a lot about the city and the camp, so my expectations were high, but they were all surpassed by the reality of what I got to experience there. Excellent sessions, lovely location, perfect weather, great food, and of course a surplus of friendly people. I arrived in the city Wednesday night, so there was plenty of time Thursday and Friday to see a few sights and get some sprinting done. Much of my sprint time was spent on the Migrate in Core initiative, with the rest going to some impromptu mentoring of a new core contributor. The sprint areas were a perfect opportunity to learn a little and teach a little, which is a huge part of what the Drupal community is all about. As for the sessions, there was one standout from those that I attended. Intro to Behavior Driven Development with Behat session, presented by George Perry, was a hands-on look at how to write Behat tests and integrate the use of such tests into your regular development cycle. We even got to see some automated tests that his team wrote run on the meetup.com site! Doing a volunteer shift Saturday afternoon meant that I missed a few sessions I would have liked to see, but it did give me a chance to speak with some of the organizers of the camp, who I must say did an outstanding job. Many kudos to everyone who helped make BADCamp 2014 a success, and I hope to come back next year!